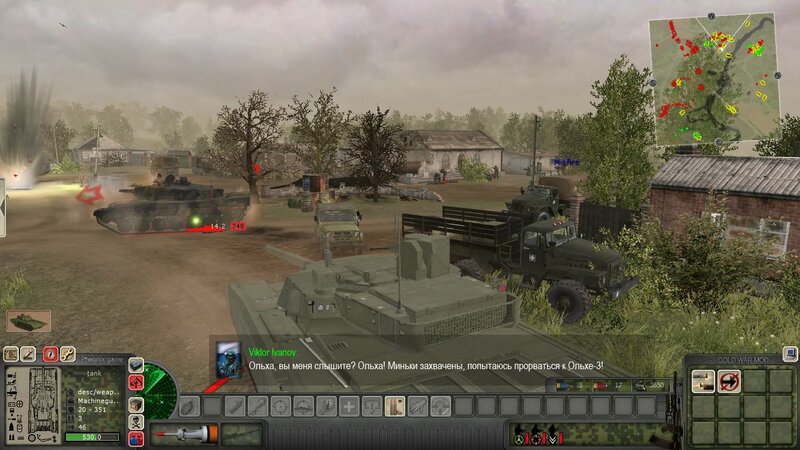 Форум » Игры серии "В тылу врага" » Cold War мод » Non- Russian Speakers Thread COLD WAR MOD General TOPIC. Non- Russian Speakers Thread COLD WAR MOD General TOPIC. You have Malakhit for Russia, JSM for USA (search in editor more thoroughly), also Harpoon and Kh-59 will be added in 1.6.3. Yes,i know both of them,i mean some kind air to sea like KH41 or some kind land to sea like Бал-Э. Hello CW team, thank you for the mod! I tried adding a nation, but CW doesn't accept it. Just a question, how do I add another nation for CW mod? (It's for private purposes)I tried adding a nation, but CW doesn't accept it. You need to insert in localisation/#dlg_ingame.lng block with names for your nation. It is obligatory. Then, make sounds for your race (search in "sound". Then, make breeds with new nation, and you will be able to use them in your single missions. Playing version 1.6.2 for Assault Squad here, in the mission "Three tankers" sometimes the German vehicles can't be damaged. How to fix this error? Thank for your support! Hey! id like to play this mod but my mowas version is not compatible with this. i have 2.0.15. so i need to play the mod ?. or give me the exact copy of the game. please i miss the game and the mod. Help a fellow gamer who loves this mod out. note the yandisk file doesnt work. soooooo yeah. dwightlaforteza, it needs MOWAS 2, not MOWAS 1. Can i mix the red rising mod and cold war together? 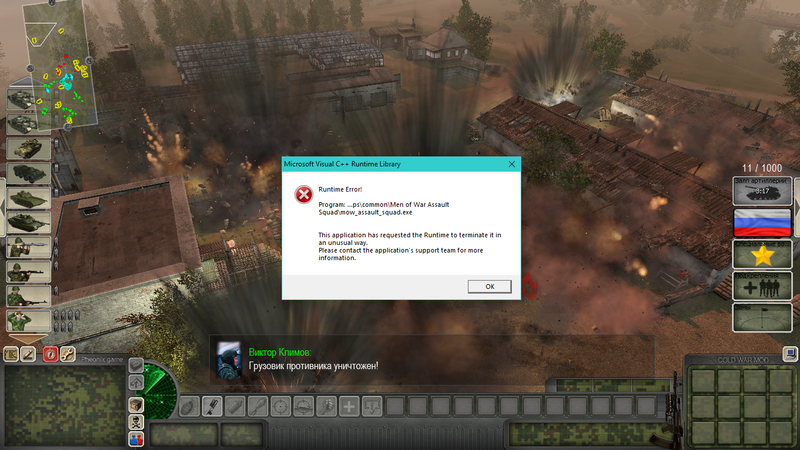 How to prevent destruction of ammo crates and helicopter in the Poltava mission? I tried killing the sappers, making craters on the wires with explosions, destroying the house where the wires come from and killing everyone in it, but the timer goes on and they explode anyway. I'm playing version 1.6.7 for AS2. I need help about this mission "Genie" I was having trouble about this message "Shaitan, They tore the front hatches! You'll have to knock them out with a good bomb or lay down some shells under it and undermine them." Please i really need help it takes hours for me to figure it out. Thanks. elizagamichael, When you're making assault through destroyer to disable anti-missile laser, you can pass the whole ship along, and its autocannons won't be able to attack you. But there are two large hatches closing side passages from front deck, so you should blow them by C4 or somesing else. After that you'll be able to walk torwards laser and blow it up with one more C4. It's not the only way. For example, you can take off ship autocannons and laser by RPG, without even boarding ship. You can attack the ship from the nose, where autocannons can't reach you. Or another way - just destroy the laser. I have a problem with the mission "Snake head". I tried stealth killing the patrol's squad leader (2 hits from behind with AK buttstock and when no one was looking), but the message "We don't have the password for this patrol" which triggers Reaper 3's take-off appears before the "We have the password" message. If anyone knows what to do then I would be grateful. I am playing version 1.6.7 on MOWAS2.